I noticed this nomadic knife and scissors sharpening guy set up his contraption in a market near Oaxaca Mexico. He could roll it along on its single wheel. When he got a customer, he tipped it slightly so the seat was up. He put the leather strap in the bike rim and then he could sit and pedal the wheel. It would turn the grinding wheel, and he would merrily sharpen away, sparks flying. I’ve seen a lot of makeshift sharpeners, but this one was the most elegantly designed ever. 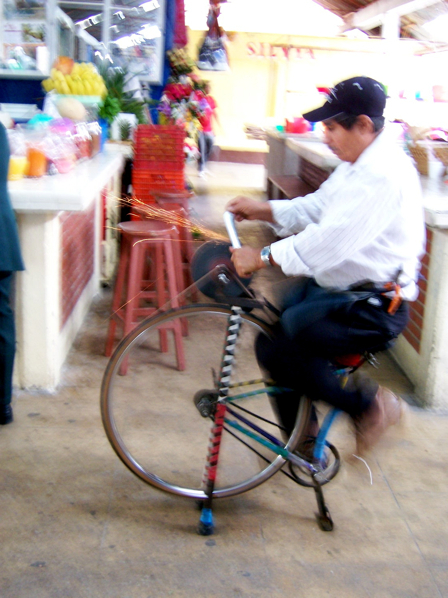 The wheeled knife-sharpener is an old tradition in Mexico, they used to roam the neighborhoods when I lived there 30-odd years ago. They had a distinctive whistle they would sound every few seconds to inform housekeepers that they were approaching, so anyone who needed knives sharpened could come out and ask for their services. Since the operators would walk dozens of kilometers a day in their hunt for customers, the wheeled contraption really is a necessity.